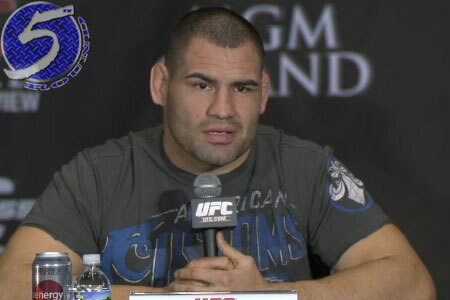 If reigning heavyweight champion Cain Velasquez (pictured) can’t shake the pesky injury bug and get back in the octagon by March, UFC president Dana White said he might be forced to pull the Dominick Cruz card on him. White told UFC.com Thursday that if Velasquez can’t return from the MCL tear that forced him to pull out of Saturday’s scrap against Fabricio Werdum, which was proceeded by a December shoulder surgery that has kept him out of action since steamrolling Junior dos Santos 13 months ago, Velasquez could be stripped of his hardware. Werdum now battles Mark Hunt for the interim title at UFC 180. Velasquez has lost only once in 14 professional outings, but avenged his blemish to dos Santos twice in convincing fashion. However, it’s not his skills that are in doubt, it’s whether he can remain healthy on a consistent basis. The 32-year-old has only fought six times since October 2010 due to various injuries. Some of the wounds occurred during his scraps, while others were in training. White believes it’s time for fighters and their coaches to refine the intensity of their workouts. Former UFC bantamweight champion Dominick Cruz was forced to relinquish his belt in January after a multitude of injures kept him sidelined for three years. The UFC subsequently created a “Title Defense Clause” (AKA “The Clause Dominick Cruz Created”), which allows the promotion to strip a champion due to inactivity. The UFC never stated a specific time period for inactivity in the clause, so each case is considered independently.